The Gate of Saint-Denis is a Parisian monument located in the 10th “arrondissement”, at the site of one of the gates of the Charles V Wall, one of the now-destroyed fortifications of Paris. It is located at the crossing of the Rue Saint-Denis continued by the “Rue du Faubourg” Saint-Denis, with the Boulevard of “Bonne-Nouvelle” and Saint-Denis Boulevard. 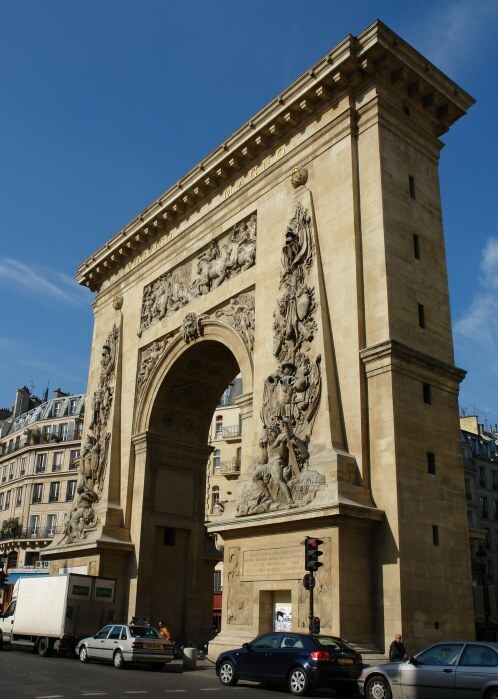 The Gate of Saint-Denis was built in 1672 by architect François Blondel and the sculptor Michel Anguier, who drew their inspiration from the source of Roman arches, on the orders of Louis XIV, in honor of his victories on the Rhin and in “Franche-Comté”. This is a remnant according to the wish of Colbert who was to built monumentals gates between the city and the suburbs of Paris. This is actually a triumphal arch (inspired by the Arch of Titus) from a height of 50 m, which replaced a medieval gate in the wall of the former wall of Charles V. A Latin dedication brought to the magnificence of Louis le Grand, other inscriptions celebrate recent victories orchestrated by the king in Holland and the Rhine in 60 days, Louis XIV passed the Rhin (18th century), Wall and the Meuse the Elbe, conquered three provinces stormed fortresses and forty triumphed Utrecht. The pyramids carved on both sides of the arch are symbolically crowned globes crowned and adorned with lilies. South side, trees wear glory helmets, armor, weapons, flags and remains of lion. North side, other symbols of military victories, such as palm trees, are highlighted. 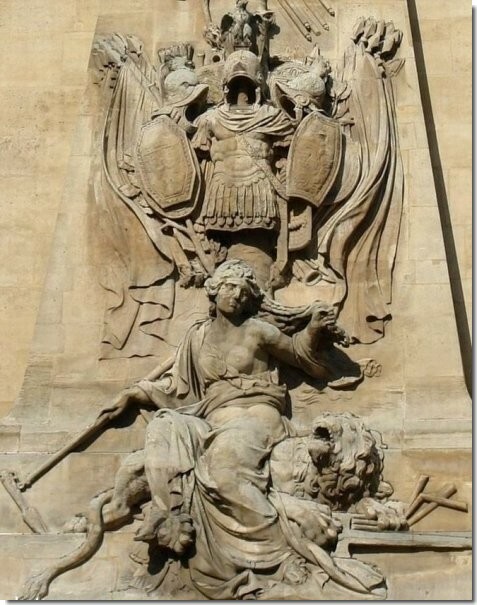 The base of the pyramids to the south, this allegorical figures: Holland, despair, is flanked by a wounded lion, roaring, crushing his paw a sword and seven arrows broken symbols of the seven United Provinces terraced, in part, the Rhine river god subdued, holding a rudder. Above the arch, two “bas-reliefs” elongated commemorate the south, the passage of the Rhine Tholus routing the enemy, and to the north, the siege of Maastricht. The Gate is located at the intersection of the axis Saint-Denis (Saint-Denis and rue du Faubourg Saint-Denis) and Boulevard de Bonne Nouvelle westside – Boulevard Saint Denis eastside. 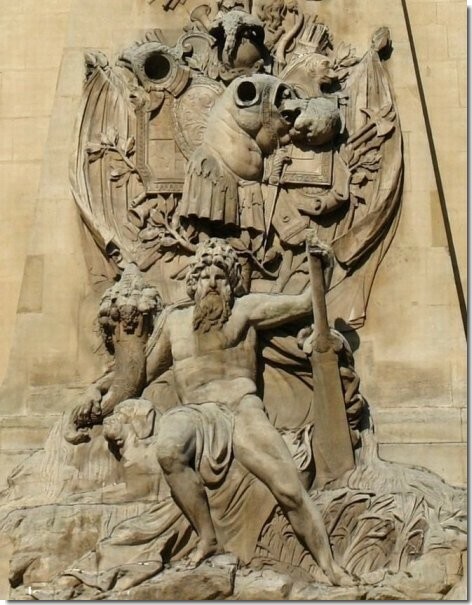 This entry was posted in FRENCH HISTORY, Paris, FRANCE on November 11, 2012 by webmaster. History of the “PONT NEUF”. Les PUCES de St. Ouen. Terracotta Edging Paris Leaf design. Large glass bottle from France, called “Dame Jeanne”. “Chaise coin de Feu” French Corner Fireplace Chair.